I have submitted the manuscript for my next book The Memory Code to my publisher, Allen & Unwin, and can finally get back to blogging my precious spiders. I have been delighted with the number of comments on this blog and emails I have received, many with photos and even videos. 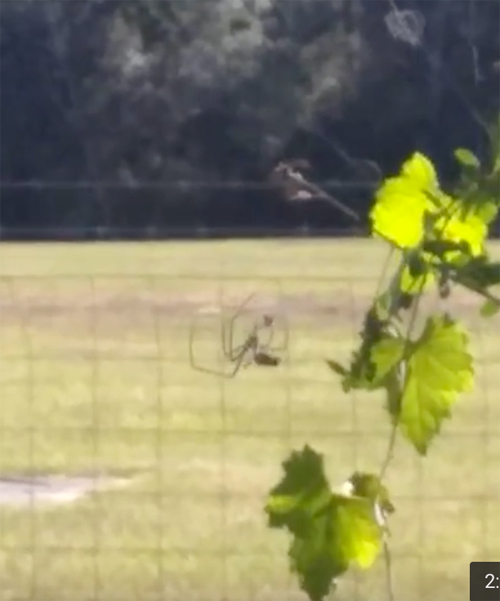 A number of American correspondents are writing with stories of golden orb weavers (Nephila sp.) and yellow and black spiders (Argiope sp.) and their golden egg sacs as the spider season in the US is drawing to a close. Ours is just starting here in Australia. Poppy has sent me a number of videos and photographs of Charlotte, the golden orb weaver who is almost certainly one of the species Nephila clavides. The videos are amazing as Charlotte is tossed around in the wind but still catches the grasshopper Poppy has tossed into her web. Poor grasshopper! Like Poppy, I do feel sorry for it, but such is the way of the world. Here are some stills from Poppy's video. I think there are two Charlottes. Poppy may explain more! 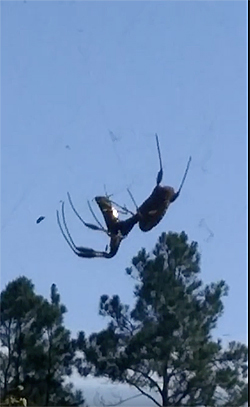 The University of Florida has a great page on Nephila clavides - just click on this sentence. This is a link to the blog I wrote about the golden orb weavers in Castlemaine, Nephila edulis, a few years ago. I would be delighted to receive more photos. I love getting comments. And I shall soon add photos and stories of my spiders. Just comment below and I will tell you how to send photos. Meanwhile - it is good to be back! Hi Lynne! Thank you so much for blogging about Charlotte! Her memory lives on! The other spider that you see is the male, her live-in boyfriend, George..very very close-up..In actuality he is maybe a little bigger than the head of a pencil. She had a few Romeos in her web, but the wind this year has been insane and George was the one who held on to the end. After all of the other spiders left it was Just Charlotte and George. I didn't realize it, but when I was watching one of the videos I sent you, George was eating a gnat, lol. Their size difference was crazy and at first I feared he was some sort of parasite spider but when I checked the other orb weaver's webs their boyfriends looked like that too. I only wish I could have filmed them..or should I say him..in action, lol! Thank you so much for writing about her, I am truly honored. I know "it's just a spider" as I've heard many times this past summer, but as you know, when you observe and feed them so much you do get attached. I really think that she had her own quirky little personality as well. I mentioned in our correspondence how she would "play" with her food before going in for the kill. I hope you got to witness that in one of the videos. I apologize for their size but I haven't learned how to edit them yet. Her sac is on the bottom of a dead leaf that's literally hanging by a thread. She wove the webbing around the leaf and the stick but as I told you, I've been terrified that the wind is going to blow it away. Yesterday I took some electrical tape outside and tried to secure the twig as best as I could without disturbing the sac. I'll go out in a bit and take some pics and send them to you. I'm really happy that you're going to start blogging some more! I look forward to seeing more posts. Since we're nearing winter here in the Florida Panhandle I'll have to wait a few more months, but I hope to be able to contribute when the spiders come out! We live on 4 acres in a rural area so there are all sorts of little creatures out here to see! I'll talk to you soon! Loving all the updates. And the promise of more. It is also intriguing to look at the other critters in the world of the spiders. I photographed a mantid today - I know they eat spiders. I'll add it here when I do the next blog. Looking forward to the next instalment of the precious Charlotte and her offspring.